2015 is finally here. 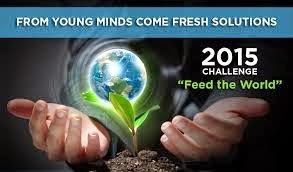 Why not start off the New Year by registering your students to use their scientific skills to “Feed the World”? World hunger has been an ongoing problem for years; let’s not let that continue in 2015. You can engage the power of today’s youth to build a better future by signing up for the 2015 Clean Tech Competition, a worldwide student challenge. · Has no entry fee. Register now for tips and guidance from competition administrators!